(NaturalNews) In a press release issued on July 4 by the organization Commons for EcoJustice, 19 separate civil society organizations and an organic vegetable farmers group have called on the government of Malawi to reject Monsanto's application to commercially plant genetically modified (GM) cotton. The list of supporting organizations includes farmers groups, organic groups, faith-based organizations, nongovernmental organizations and media outlets. 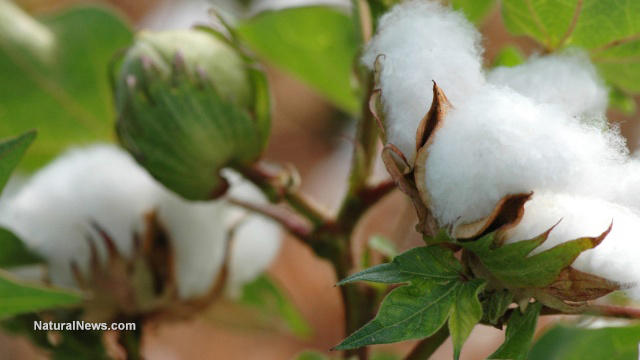 Monsanto has applied for a permit to release the GM cottonseed known as MON 15985, or Bollgard II. The cotton has been genetically engineered to produce an insecticide from the bacterial species Bacillus thuringiensis (Bt) within its tissues, making it poisonous to butterflies and moths. If approval is granted, Malawi would become only the second southern African nation to allow the cultivation of GM crops (South Africa began GM crop cultivation in 1997). Civil society groups have objected to the approval on both scientific and socioeconomic grounds. From a socioeconomic perspective, one of the greatest concerns has been the impact that approving the GM cotton would have on Malawi's small-scale cotton farmers. The press release notes that most cotton farming in Malawi is carried out by such small-scale farmers, comprising about 400,000 families. Many such farmers rely on public-private partnerships -- such as the Cotton made in Africa project financed by the German government and the Bill & Melinda Gates Foundation -- that prohibit the use of GM seed. Genetic contamination by GM cotton could ruin these farmers' livelihoods. The civil society groups object that Monsanto has failed to consult small-scale farmers or other stakeholders about the likely socioeconomic impacts of releasing Bollgard II. They note that in, South Africa and Burkina Faso, many farmers went into debt following the release of GM cotton, due to the high price of seed and the loss of export markets in GM-free countries. Small-scale farmers, due to their lack of bargaining power and inability to afford insurance, are at greater risk of this. In addition, Monsanto has made insufficient effort to address concerns over genetic contamination of non-GM fields. The company's "refuge" plan consists of permitting only 80 percent of the country's cotton crop to be GM, but it does not take into account where such crops could be planted or evaluate whether this would actually provide a genetic refuge. The company has suggested very few ways to train farmers about the refuge plan and has not attempted to engage neighboring countries that might be affected by cross-border genetic contamination. The groups also allege that the science behind Monsanto's application is flawed. They note that the company has not publicly released the results of its field trials, making it impossible for neutral scientists to conduct a peer review and "making it difficult, if not impossible, for the public to meaningfully engage with Monsanto's application." The application also ignores the potential for pests to develop resistance to the Bt pesticide, even though Monsanto actually developed Bollgard II precisely because insects were becoming resistant to Bollgard I. Around the world, increased use of insecticides and herbicides -- including the insecticides produced by GM Bt crops -- has accelerated the evolution of pesticide resistance in targeted species. "Due to mounting global problems of insect resistance to Bt crops, a comprehensive resistance management plan would seem to be essential for minimising these risks," the organizations write. "Contrary to biosafety best practice, Monsanto has shockingly proposed submitting a long-term resistance management action plan only after resistance has already been confirmed for an affected area." Increased Bt resistance caused by the use of GM cotton would actually lead farmers to increase their pesticide use, the groups warned, thereby defeating the supposed purpose of the GM crop.